Many industrial facilities utilize steam to generate energy and complete different operational processes. While these different industries generate and use large quantities of steam on a regular basis, they usually do not possess the complete expertise needed to manage their respective steam systems. While personnel is usually trained to operate these systems, rarely are these employees designated solely for maintenance and repairs. This often leads to unforeseen repair needs that could have been easily avoided if the steam system’s upkeep was done consistently. Regular maintenance often results in high levels of energy efficiency, as leaks and other types of damage are avoided, with any existing problems being addressed in a timely manner. This leaves very little room for the damage to result in wasted fuel or steam. 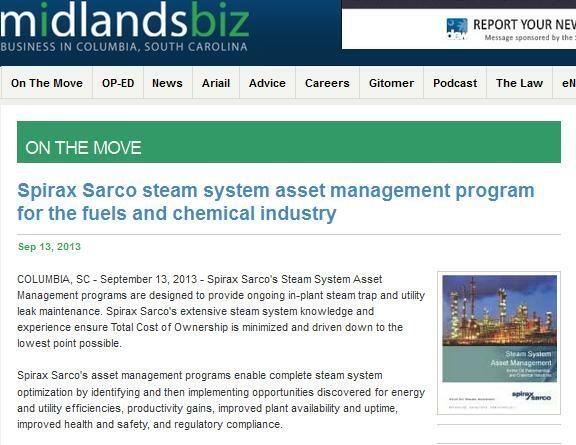 “Spirax Sarco’s Steam System Asset Management programs are designed to provide ongoing in-plant steam trap and utility leak maintenance. Spirax Sarco’s extensive steam system knowledge and experience ensure Total Cost of Ownership is minimized and driven down to the lowest point possible. As Spirax Sarco is a manufacturer of steam traps, and boiler and pipeline control valves for handling and steam fluids, they are adept at managing systems composed of their products. Experts recommend that commercial and industrial facilities in need of steam system management acquire these services from the companies that produced the current systems they’re using. As for parts, they don’t have to necessarily be acquired directly from the manufacturer. Parts can be obtained from an authorized supplier like A.L.B. Industrial Supplies, Inc., which offers a wide selection of steam system parts from all the leading manufacturers. Some reputable suppliers don’t require their clients to place minimum orders, and offer same-day delivery services to anywhere in the country. When the utilized components are authentic, it facilitates ease of maintenance and ensures system performance of the highest level.